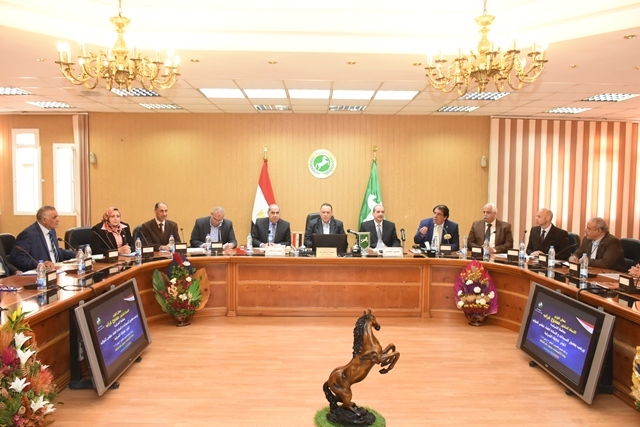 Dr. Mamdouh Ghorab ,Governor of Al-Sharkia called upon the heads of the centers, cities and neighborhoods to prepare a plan to expand the entrances of the cities and restore the aesthetic and civilized face to them in a way that suits the citizens as a link between the governorate of Al-Sharkia and neighboring governorates …This came during his meeting with the members of the House of Representatives in the presence of the General Dr. Hussein al-Gindi General Secretary and Gen. Saeed Abdul-Muti, adviser to the governor of projects and directors of service directorates and heads of centers, cities and neighborhoods, and the meeting hall in the General Diwan. The meeting discussed the latest developments in the legalization of the status of property on state land. The Governor affirms that it will not allow infringements on State property lands and the application of the law to violators. Governor of Al-Sharkia directed Director of Legal Affairs Department in the General Diwan quickly expedited the completion of legal procedures for the allocation and replacement of land necessary for the establishment of projects in sectors (Education - Health - Housing - Youth) for the benefit of citizens. Dr. Mamdouh Ghorab, Governor of Al-Sharkia, stressed his keenness to establish a mechanism for continuous coordination and cooperation between the executive bodies and the members of the Chamber of Deputies in the governorate to discuss and discuss the needs and services of citizens and improve their lives for the best and support the ongoing development strategies and projects with the development of proposals and visions to find radical and non-traditional solutions to the problems and issues that are suffered by the governorate.